Back in July, I shared that Jordan and I were going to try out ING Streetwise accounts to see if it was a good investment fit for us...I'm so very pleased to share that it has been an overwhelming success! We both chose the Streetwise Equity Growth Fund and it's been amazing! In just 6 short months - the funds have already increased by $1,027.92...talk about a way to increase your networth! If you are planning on switching to ING Direct, consider using my Orange Key. If you deposit $100 or more, we'll both get a bonus $25! This is my obligatory 2013 spending recap post. For the most part - I'm satisfied with the percentage of our income that we're spending in each category. I think going forward I'm going to collapse the Pets and Travel categories because all of our pet shopping is done at the grocery store and so included there and Travel was meant to be for vacation travel, but I rarely remember to separate it - it's just included with gas expenditures. I may also get rid of Medical - because again, prescriptions and other medical items are purchased where we purchase groceries and I rarely remember to itemize receipts. When I first started tracking our expenses - Jordan and I were both shocked at the amount of money we spent ingesting things...our Alcohol, Eating Out, and Grocery budgets were very high. For the next few years we slowly chipped away at our spending in those categories and made some great progress. This year however...we slipped. We spent $17,592.56 on putting things in our (or our dogs, or our friends) mouths! That also includes anything else we would have bought at a grocery store including housewares, cleaning supplies etc. but Wowza! That's almost 45% of our spending.... Now, I don't think there's anything inherently wrong with that - but we do have a choice to make. Continue spending like that, or choose to spend less in those areas if there's something else we want our money to be doing (like....paying down that $29,000 LOC). We're pretty consistent with gas, clothing, education, and gifts - no issues there. Though going forward I expect clothing costs to increase due to the expectations at Jordan's new job. Groceries has been on the rise and as already described eating out and alcohol took a dip in 2011 but then have been rising ever since. Entertainment is on the rise as is vehicle maintenance - though with having two vehicles again, I'm not surprised with the dip and the return to 2010 levels. Home Maintenance is back to normal levels now that we're not in 'brand new house, we want to buy everything to make it pretty' mode. What is becoming evident however; is that our weekly budget of $300 just isn't cutting it...need to have a think about our spending strategy...and perhaps our non-spending strategy. I have good news! I called to update our auto insurance now that both vehicles are commuters - and our annual premium actually went down by $1! Crazy! I thought for sure it would go up, but the second vehicle being a commuter was off-set by the decrease in premium because of the shorter distance traveled for me. Yesterday I wrote in detail about where Jordan and I stand with our debts - today is all about what we want to save and plan to spend in 2014. I don't think we'll make it to 100% of the baby fund - but I want to have this full funded for when we eventually get pregnant and I go on maternity leave. Nine months won't be enough time though, so we've started saving now. $4,500 represents one month of expenses (I know, crazy!) and I would like to reach that this year. Christmas/Gifts is always saved for and spent as is vacation. I've got our personal accounts tracked with goals - but Jordan's real goal is until he has enough for a PlayStation 4 - he's got some gift cards too, so I'm sure this will be spent soon. I'm a hoarder and never know what to buy myself...so I've got some leftover birthday money and some Christmas money in my account. We're not actively saving for any home improvements right now but I stuck a couple hundred dollars their just in case anything comes up. As you already know - we don't have any automatic savings set up for these except for the baby fund ($40/week) because of the unpredictability of Jordan's wage. I wanted to start the year strong, so started each account with some cash from Jordan's vacation pay out and my end of year bonus - but the rest will be ad-hoc (the same as the additional debt payments). I don't track retirement as a particular savings goal, because it's just so automatic. Each of my paydays we contribute $50 to purchase shares where I work through a payroll deduction program and my pension savings are an automatic 5% from my employer and 5% from me (not optional). I also still contribute $25/week to my RRSP streetwise account. 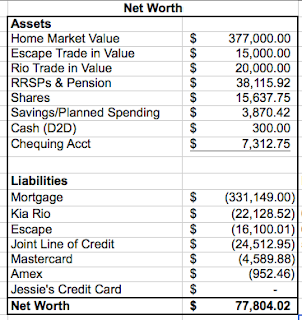 Jordan has no work RRSP program (he has under $2,000 from a previous job that did deferred profit share into an RRSP account) and so his savings are $75/week. So all combined - I expect our retirement portfolio to increase by about $14,200 plus whatever market fluctuations we experience. The last thing to decide is how to determine if Jordan's commission is automatically put to savings or debt - do we rotate it, or do we split if 50-50...or 80-20....or some other percentage. 2014 - Debt Pay Off Plan! Well - it's time. All of the holiday bills are in, and I've reconciled my spreadsheets with who we owe what to. We had done a lot of holiday shopping for other people, a lot of shopping for ourselves and each other - as well as travel and some emergency expenses (parking, meals out) we had in December (my grandfather had a stroke). We are still holding on to a lot of cash while we wait to see what Jordan's first pay looks like (Jan 15th), and we are still waiting dental reimbursements ($3,000), and school reimbursements ($900). All of that said - I wanted to get our tracking bars updated, and start the year off on the right foot! We have though - started making progress and it shows in our Networth which has already increased by about $2,200 in the first week of the year. We paid off the Amex card which was around $900 owing, settled up with our family that we purchased gifts for (on their behalf), and made a payment on the MasterCard. I transferred the balance (as it was about to start accruing interest) over to the LOC, so the M/C balance is now also $0. The LOC, with an interest rate of 5.49% and the Escape with an interest rate of 6.90% are our two debt priorities for this year. In the short term - we are expecting the dental and educational reimbursements which will bring the balance down to $25,100 - from there we have regular weekly payments of $100 which will bring it down (throughout the year) to $19,900. We have about $6,000 in our chequing account earmarked for the LOC as well which should get us down to about $14,000. So - in pretty short order we should have gotten this down quite significantly. Our ability to get the rest of it paid off will depend greatly on Jordan's income which we expect to vary quite a bit. The LOC maximum is $40,000 so once we get $5,000K paid off, we can move the balance of the Escape over and save a bit on interest there. The Kia is at 0% interest - so we'll pretty much just ignore that as far as additional payments go. Happy New Year - Meet My Family! One of my cousins was feeling inspired when we all got together on Boxing Day this year - and convinced us to create our own little music video. I wanted to share it with you....though I'm not going to tell you which one I am. I hope you enjoy it!! We sure enjoyed making it! and so it begins, a new year of Networth posts, goals, updates, spending reports and the personal finances in all of life's moments - both large and small. Like many of my other blogging peers, the first few weeks in January will be filled with all kinds of posts around plans for 2014. While I don't have any resolutions to share, or grand plans just yet - I'm sure it will come together in time. I'm still in vacation mode - but wanted to get my Networth update done. 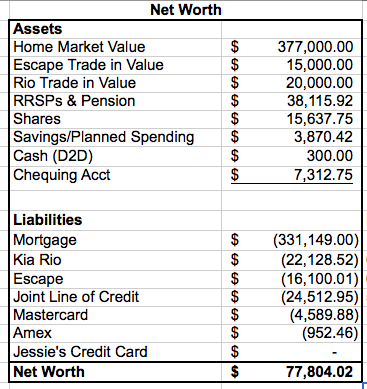 This months Networth update shows you that our chequing account has a significantly higher balance than normal - and that our Mastercard and American Express card have higher balances than normal - this is because we have not moved any of the income from my 30 hours of OT, $600 year end bonus or Jordan's final pay and vacation pay out. We're holding out until Jordan's first pay day on January 15th as he's moving from bi-weekly pay days to twice monthly. We also have some cash that we haven't applied to our accounts yet from my family paying us back for doing some shopping for them. I expect that February will see a big upswing in our Networth.